In Arcade Fire's early days, the band were known for packing as many members onstage as they could and just letting it rip, shouting and stomping around as much as actually singing, turning each performance into a sweaty, vaudevillian mess of joy. And while their live shows have naturally grown up with their profile and fan base, you can still hear that ragged exuberance on Friday Night, the live album from Arcade Fire extraordinaire Will Butler. 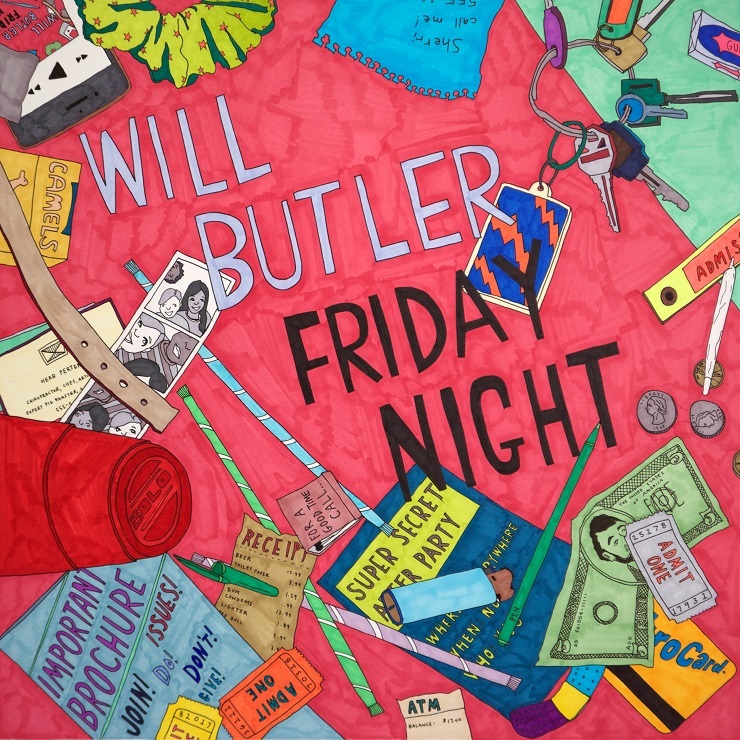 Honestly, the very existence of Friday Night at this point in time is bizarre; it's a live album released one studio record into Butler's solo career, and it's not like that aforementioned album — 2014's Policy — was particularly well-received or high profile enough to warrant a revisit so quickly (though, is anything, really?). Yet, Friday Night succeeds where Policy didn't by capturing Butler's weirdness, giving listeners a front-row seat (or torso-pressed-against-stage standing spot, as it were) to hear Butler's music as it was meant to be hard: messy, sloppy and tons of fun. Butler's music is an inconsistent blend of rockabilly, garage rock and synth-pop, and on Friday Night, the dulling production of Policy is scuffed and stomped off to let the tunes' freak flags fly. The studio version of "You Must Be Kidding," a deluxe version-only Policy cut inspired by a news story and released the next day, is a tinny freak-folk track on record; here, it's a rollicking avian beast (literally: Butler is practically cawing during the chorus) that's as fearsome as it is fun. You can practically hear Butler thrashing around during "Take My Side," on which the exhausted rasp in his voice makes one think the song was designed to be performed after an hour of romping around onstage. There are new cuts too, and while they continue to eschew any one specific sound, the buzzy energy of a packed, tiny venue is enough to keep them compelling, as heard with garage rocker "Public Defender," one of the new cuts, where a rapid-fire "na na na" chorus feels off-kilter and brash, instead of over-practiced and mechanical. There's also something new for even those who saw Butler's live shows: Friday Night opens with an encore track, "Tell Me We're All Right," a half-improvised jam that was only played once, followed by a jarring zap back to the actual beginning of the show with an intro courtesy of comedian Jo Firestone. It's all weird and ramshackle, but it fits the music so well. With each improvised yelp, clap and audience holler, Butler has created a record that captures his sound, in spite — or, perhaps, because — of his unwillingness to stick to one.